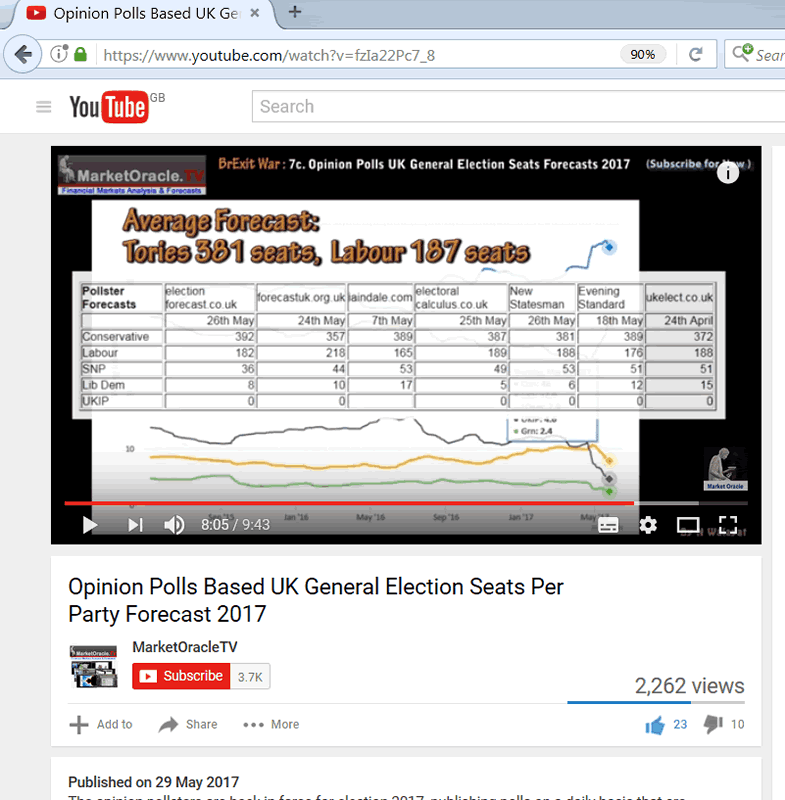 My recent video analysis concluded in seats per political parties forecast conclusion for Theresa May's snap BrExit general election, based up on the sum of 6 weeks analysis that is set against the opinion pollsters who are literally all over the place with YouGov even today forecasting 304 seats for the Tories whilst others range to as high as 385 seats. 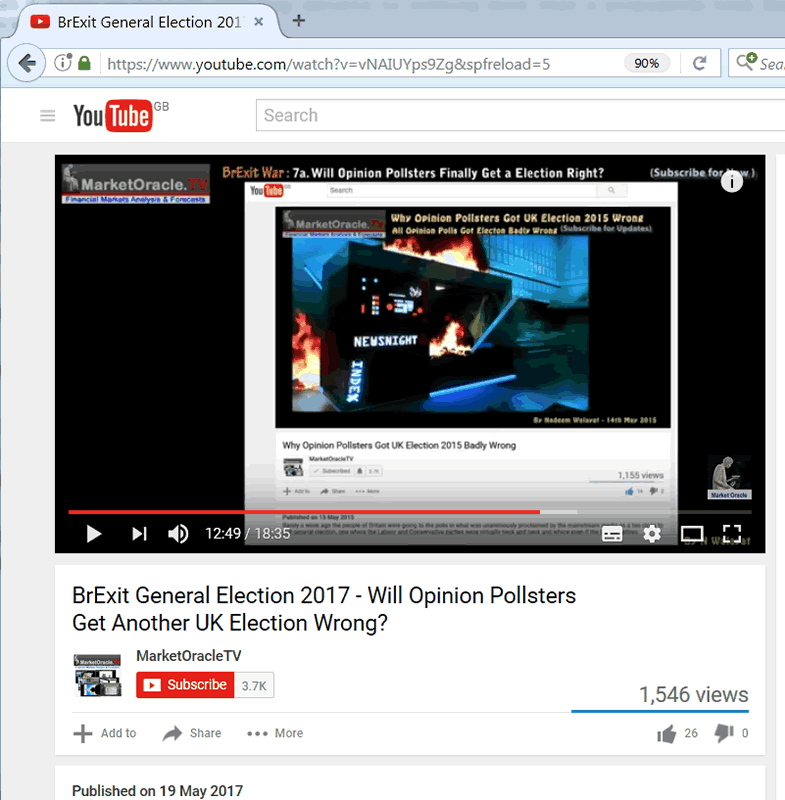 I started the ball rolling with Theresa May's calling of the snap general election where at the time the polls were all forecasting a landslide election victory, which implied we were heading for a boring election, i.e. what's the point of analysing an election when the outcome appears so certain, so it would be a few good weeks before I started to get really interested into analysing this election. Next was a recap reminder of just how bad the pollsters had been for virtually every major election of the past 5 years, for instance a Labour led Coalition was supposed to have won the 2015 General election. Therefore the polling industry amounts to nothing more than a propaganda tool for vested interests who commission the polls. 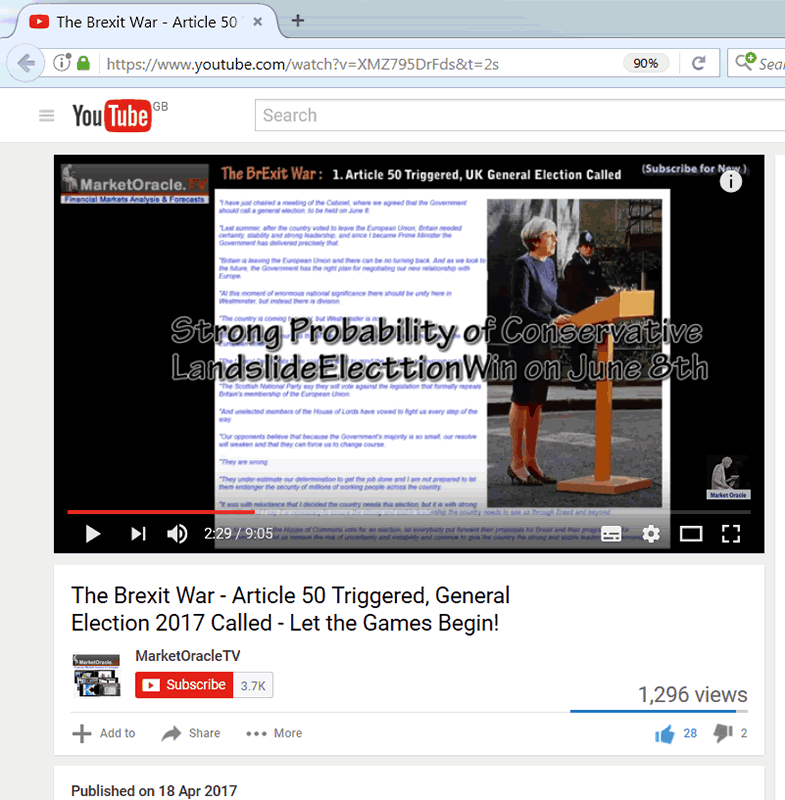 Then we had the local election results of 4th of May and what they were forecasting for the outcome of the UK general election, which gave the first warning signs that the pollster expectations for a landslide election victory were wrong! 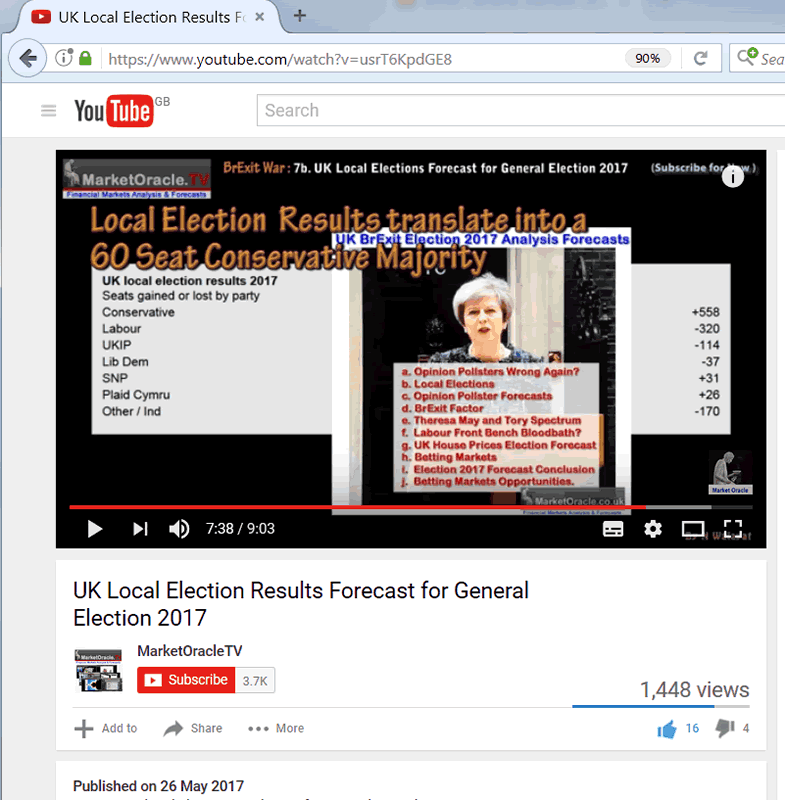 As the local election results translated into a 60 seat Tory Majority not the 100 to 140 many were forecasting at the time! 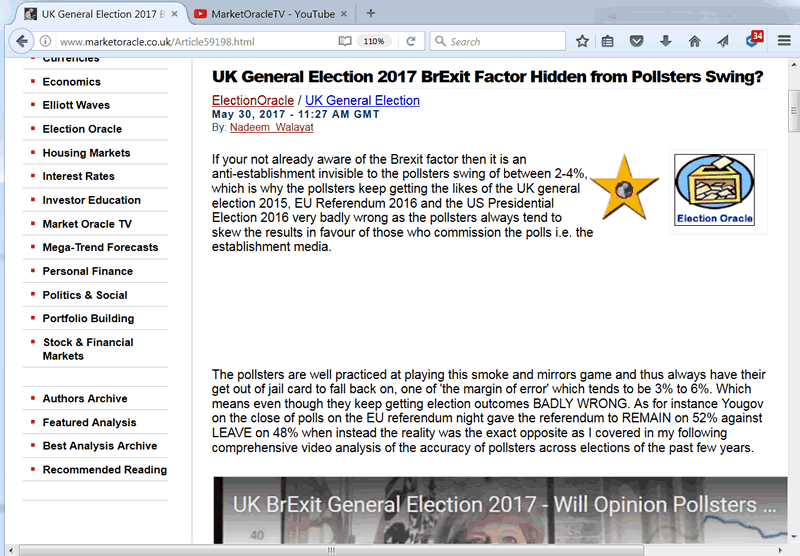 My article on the BrExit factor a hidden from pollsters election swing in favour of Brexit was unlikely to materialise in the BrExit election as voters questioned by the mainstream media appeared eager to state that they would be voting for Theresa May because of BrExit. 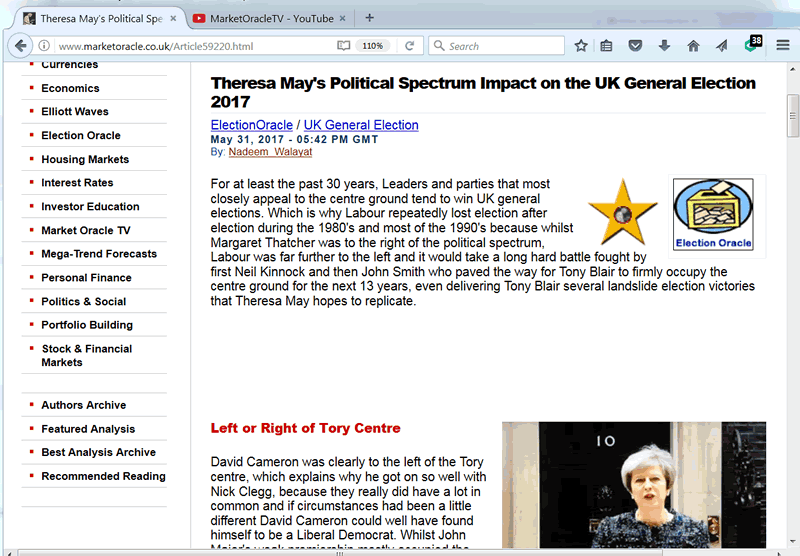 My article on Theresa May's position in the political spectrum concluded that she would hoover up many Labour and most UKIP voters and thus she was heading for a strong election victory. 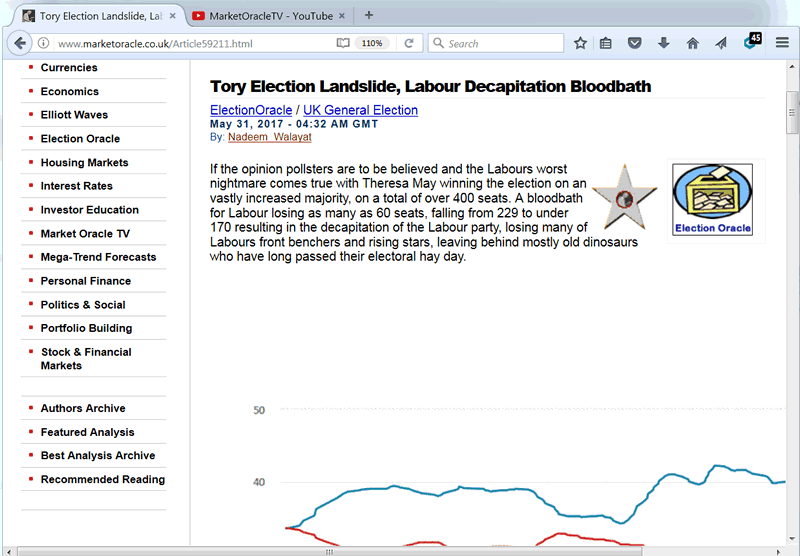 My next analysis warned that a strong Tory election showing could result in a decapitation of Labours brightest rising stars, leaving behind mostly old dinosaurs which could knock the Labour party for another decade. In my next analysis I took a look at what some of the popular polls based pollsters that the mainstream press were obsessing over were forecasting in terms of the number of seats per party at that time. 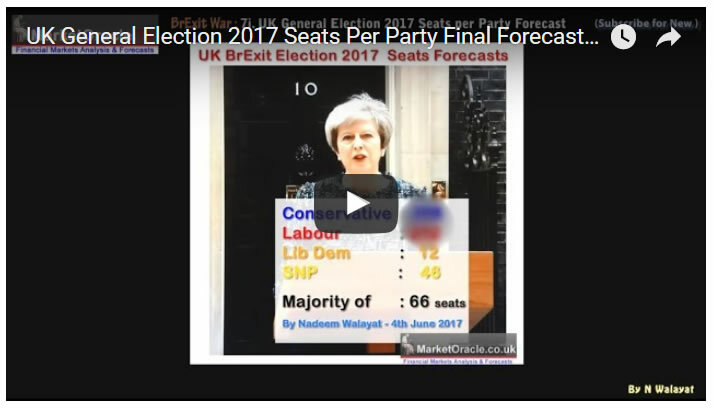 The average of the forecasts was for the Tories to achieve 381 Seats against Labour on 187 seats, which was a landslide majority of 112 seats. 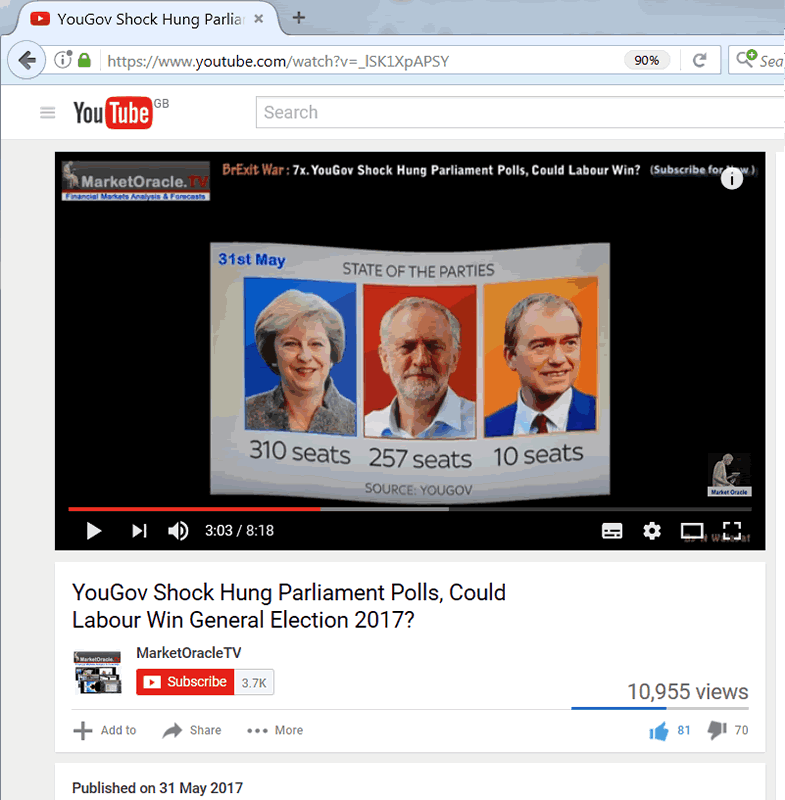 Then we had YouGov with their shock poll warning of the Tories losing 20 seats falling to 310, which at the time I warned was total BS, purely aimed creating interest in their junk polls, and warned at this rate by June 7th YouGov could even give Labour the lead, whilst their latest forecast has the Tories tumbling to 304 seats. 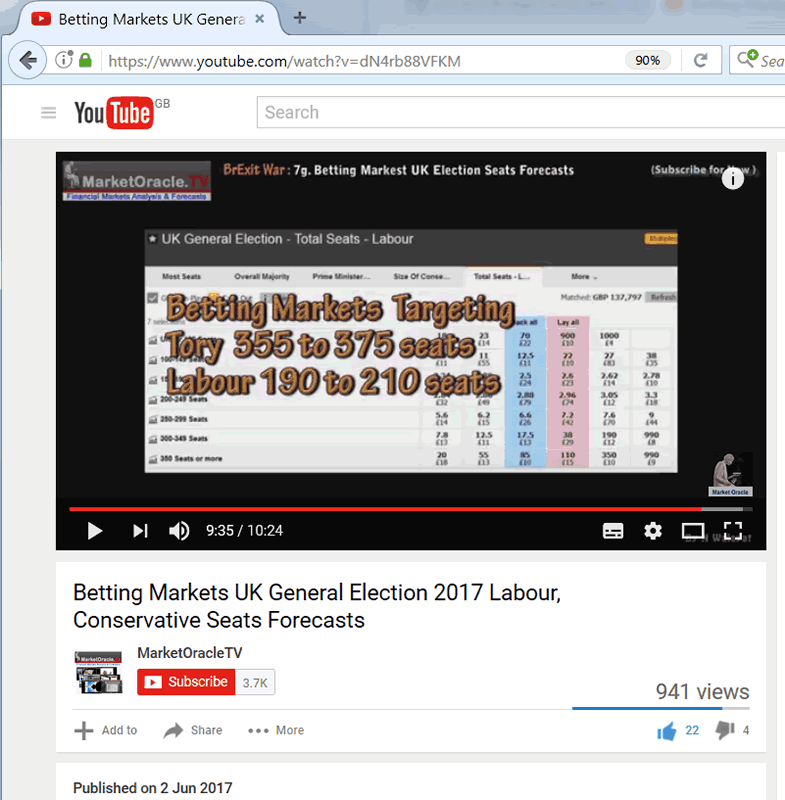 What the betting markets were forecasting was next which given the various bets available coalesced around forecasting probable ranges of outcomes for the Tories on 355 to 375 Seats, and Labour on 190 to 210 seats. 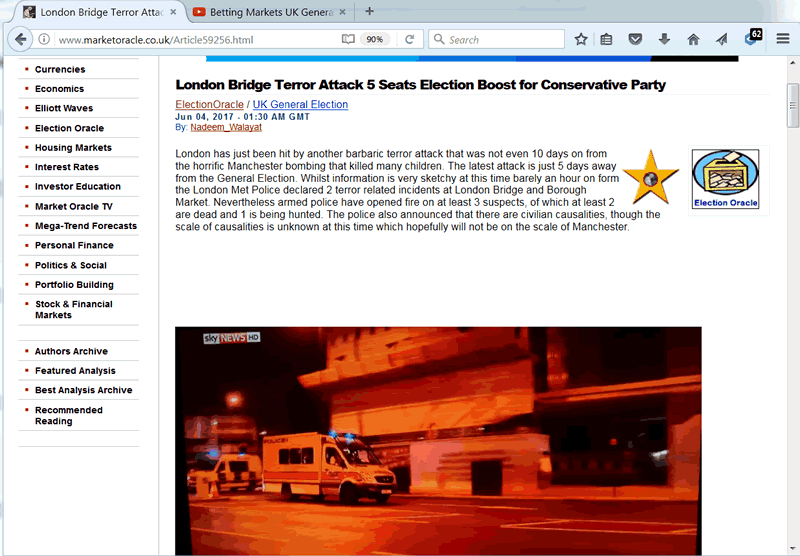 Then less than 24 hours ago we had the barbaric London Bridge terror attack which was not even 10 days on from the horrific Manchester bombing. Where I concluded that it could boost the Tories as the party of law and order by about 5 seats. 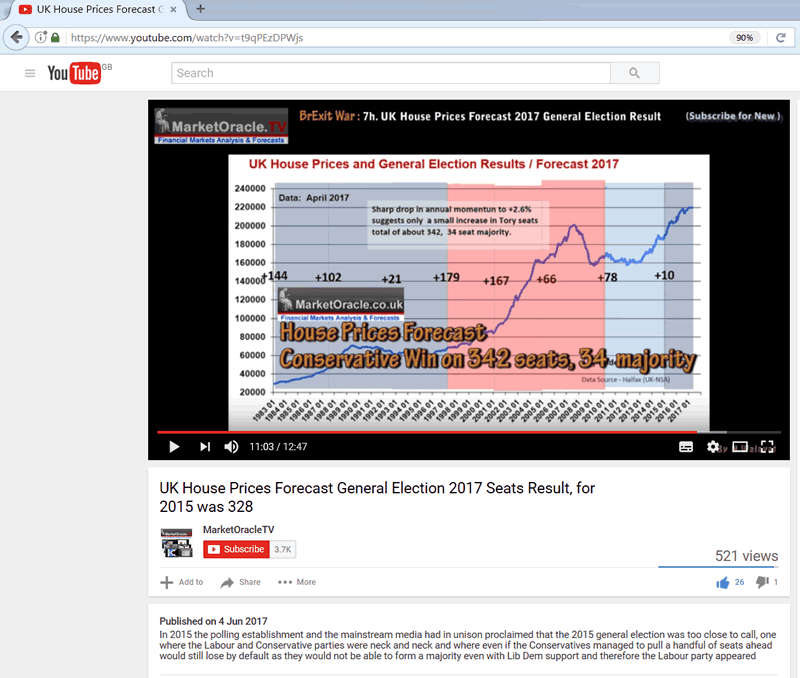 And last but not least is what UK house prices forecast for the 2017 general election, given that UK house prices were by far the most accurate predictor for the 2015 general election, with the final house prices data ahead of election forecasting the Conservatives would win on a single digits seats majority of about 328 when the actual result was 330 not counting the speakers seat. For this election UK house prices momentum analysis concluded in a forecast of 342 seats for the Tories, which once more is significantly different to what the pollsters and bookies are expecting. 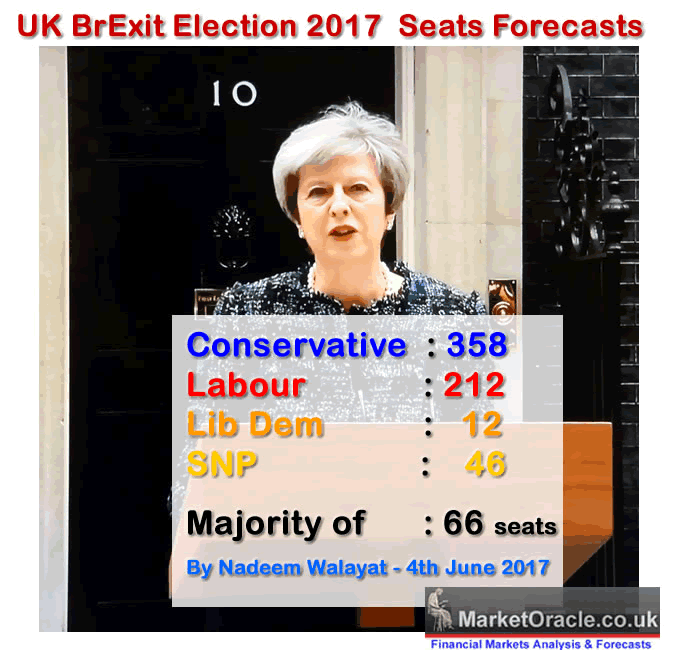 And so here is my UK General Election 2017 final forecast conclusion on the basis of the sum of my analysis of the past 6 weeks which is for the Conservatives to win the election with a 66 seat majority by increasing their seats total from 331 to 358. I expect Labour to drop by 20 seats to 212 with the Lib Dems gaining 4 to 12, and I expect the Scottish nationalists to lose 10 seats by dropping from 56 to 46. What if this forecast proves inaccurate, what then could the next most probable outcome be? We'll whilst I had been creating the video I had the scene from Game of Thrones end of Season 6 playing in my mind, where Cerci Lanister is preparing to attend her trial at the Sept of Baelor, but when she does not turn up it slowly starts to dawn on Queen Marjorie that something is very seriously wrong, as Cersi Lanister has plotted to incinerate all of her enemies by blowing up the Sept of Baelor with dragon fire. Theresa May is Cersi Lanister! And so I would not be surprised if she really does blow up the Labour / SNP coalition hopes by winning a landslide election victory!